In case you've been wondering where I've been, as there has been a deficit of postings, I've been out searching for sidewalks! Since my last posting, my feet have sampled a number of sidewalks and I have to say that the more I hit the pavement the more I crave. I've put on a few miles walking on concrete, asphalt, cobblestone, and more over the past five months. Can't say that I prefer one over the other, as they all seem to work by getting me from one place to another. And, of course, as my wife tells me, I can't complain about any sidewalk because all that she seems to hear from me (her story) is that I want to walk out our front door and be able to connect feet to sidewalk and get somewhere, anywhere! May seem that I'm fickle, but not entirely. At times, sidewalks lead to places that one has been to before or one you need to go to; other times, they take you to places that are new to your experience and give all the credit in the world to your desire to try out a new-to-you sidewalk. There is a method to my sidewalk madness...they connect you to new people and new places. Last month, they connected us to Watkins Glen. My wife wanted to escape town for a few days and she announced, "I have a great sidewalk to show you!" Always up for a trip that involves a path to somewhere, I packed quickly and happily and was soon in the car to head west. It's a four hour trip from our non-side-walked home, but worth it for the scenery, the lure of sidewalks and for something else that I knew was in the area, wineries! What the wife hadn't told me is that the sidewalk she had in mind to visit was of the vertical kind. She drove us to the Watkins Glen State Park. There, one is treated to a two mile hike...up! Well, one way is up. To get back to the car you get to walk down! 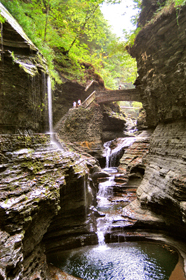 Carved out by water, for probably more than a few years, a gorge ascends between 200 foot cliffs and features a stream that descends 400 feet. They advertise no less than 19 waterfalls, and you get to run under and around some of them as you make your way up 800 steps...yes, 800. How do I know that? I counted every single one of them. Worth the trip if you like waterfalls, and gorges, and getting spit on by mother nature, but more so because it's just a short drive to Penn Yan. And, what's in Penn Yan do you say? And stores and shops and a rail trail that goes between a couple of those Finger Lakes that are surrounded by wineries. Over one hundred of them. More wineries than we could do in one day, turns out. We tried, well that's another blog. The best thing about Penn Yan is where we stayed. I'm fairly certain that my wife used the lure of sidewalks to get me to a B&B that she had visited a couple of years back. She and a college roommate had done a winery and yarn trip (yet another blog) and stayed at a place about which she raved upon her return. She talked up the wineries (a favorite of mine), the towns (ergo sidewalks), and some good restaurants, and then said, "Let's stay at this place I went to." She described it as a pretty Victorian House, run by a nice couple, and they make a great breakfast, and you get to talk to people (another fact...sidewalk deprived folks don't have many people to walk to and talk to) and "it has a sidewalk that leads you to town and to stores and to restaurants, just like where you want to live." I'm not hard to please, really...give me a sidewalk and I'm off. We did the steps (did I mention 800 of them? ), lunch in town, a winery or two (okay, five of them), and then landed in Penn Yan at the aforementioned B&B, "La Belle Vie." My wife was a little off in her description of the inn. Pretty? It was gorgeous. Victorian? 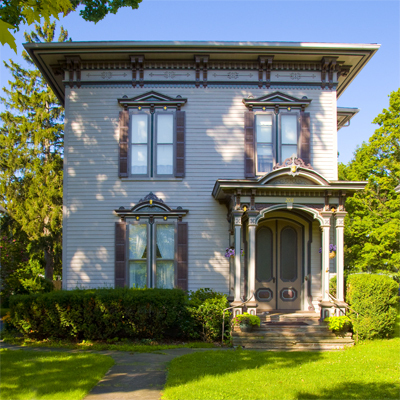 Highly so, and Italianate...impeccable inside and out. And, a wonderfully hospitable couple, Laurel and Llewellyn, greeted us in the driveway as we arrived and took care of us as though we were many-times-returning friends. I've been in the hotel business for over 35 years and have always said, "Clean room, good food and good service and I'm set." Well, the proprietors of "La Belle Vie" have set a new standard for me. I've also stayed in a few B&Bs in my day, but have never felt the warmth of the owners such as here and the place was spotless. And the, the breakfast...amazing!!! I don't think I've had a better breakfast anywhere, ever. Laurel cooks, Llewellyn serves and you don't want it to stop. The scones and the pancakes were beyond belief. And, perhaps it's because Llewellyn waits on you (have you ever seen that at a B&B? ), the eggs were the best I ever had. Coffee? Served. Breakfast? Served. Are you sure you're done? How about seconds? Of course! 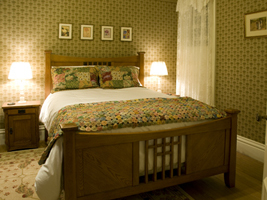 And this is a B&B. In another such place you might find a buffet laid out with muffins and boxed cereal, without a person in sight, with signs, "help yourself." Not here. I have to mention the menu and I don't want to get this wrong, but I think the pancakes were Lemon Ricotta. And, Lemon scones...I didn't want to leave the table. This reminds me to ask for the recipe, though I doubt they'd taste as good without the company of Laurel and Llewellyn. Once the breakfast is served, with Llewellyn at your beckon call, Laurel joins all in the Dining Room (we were one of three couples that day), and great conversation ensues. I all but forgot about sidewalks! The whole place is about relaxation and comfort and the proprietors make everything happen in a gentle and relaxed fashion...just really nice. 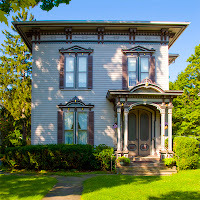 Now, I like to visit wineries, and I like to go to towns that have sidewalks, such as Penn Yan, and really just enjoy traveling to different places to see the sites, and the places we stay are usually the means to the end, but you need to know that I would make a trip back to the Finger Lakes just to stay at "La Belle Vie." The next installment of my blog is in the works, so don't fret. We did visit about twenty wineries and have made a few other trips over the past few months, so more to come soon. But first, I must get that recipe from Laurel and Llewellyn at "La Belle Vie," so that "ma vie sera mieux." I remember those steps, there has to be more than 800.